Get your students talking with the new Microsoft platform that's already being used by hundreds of UTS staff members. Daryl Adair’s Tech Showcase presentation covered how Microsoft Teams has helped increase student engagement in his Sports Business class. Teams is one of the apps UTS students and staff have free access to as part of their O365 subscription, so it’s easy to set up and is fully supported by UTS. Academics like Daryl are exploring how this app can be used to help facilitate teaching. Daryl recognised that it’s often challenging to engage, mentor, and monitor students’ engagement once they step outside the classroom. He had tried UTSOnline Discussion Boards and secret groups on Facebook, but neither offered the solution he desired-so he started using Teams. He found Teams helped reduce email clutter by keeping all online class material in one easy to access spot, generated thoughtful on-topic discussion, and – best of all – the students were having fun. Daryl’s presentation ran through these findings and explained the strengths of Teams when used in an education context. These strengths include its channels, visual media, and easy access. Channels are the backbone of Teams’ structure. Channels work by dividing the conversation: each channel is for a dedicated topic. 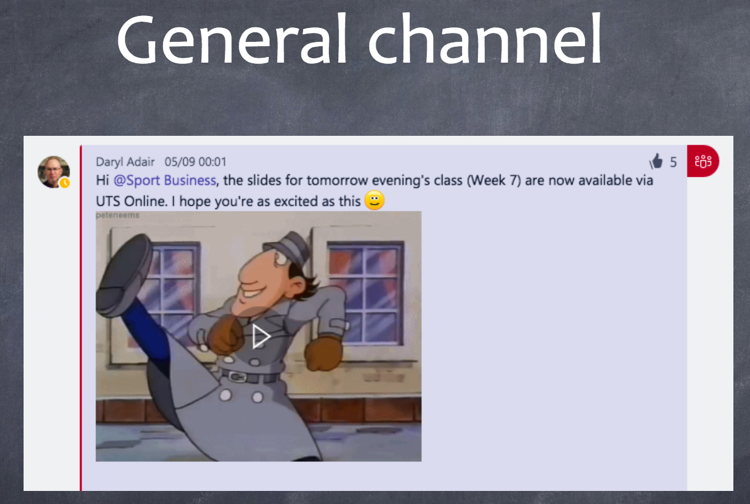 Every Teams has a general channel where the course content can be posted, but Daryl added an icebreaker channel and a newsworthy channel where students could introduce themselves and discuss sports business news. This is a great way to organise communication, make information easier to find, and ensure conversations stay on track. All channels are public, meaning that the whole class can see them and contribute, but Teams also has private chat if you need to have a one-on-one discussion. Teams uses profile pictures as well as names, so both Daryl and his students found that it was easy to build an authentic rapport with each other while using the app, and then transfer that connection to the classroom. 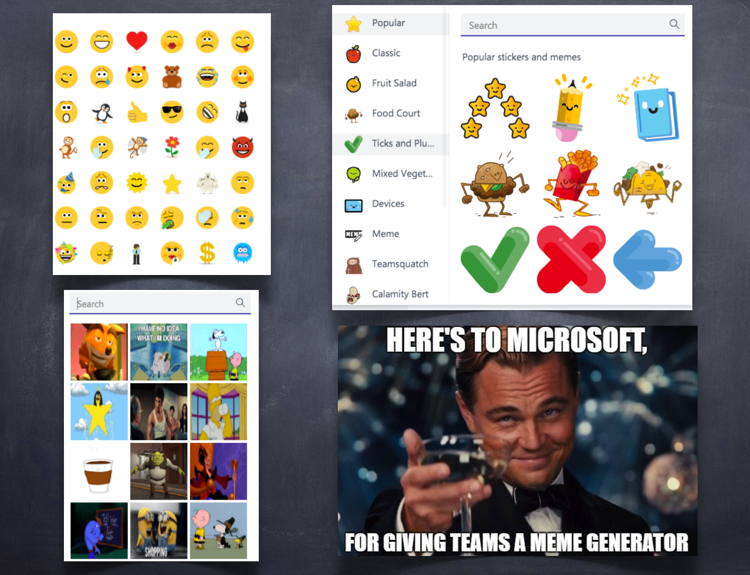 Teams also has stickers, gifs and an inbuilt meme generator, which encourages creative communication. It gives participants a chance to show off their personality and have some fun. Teams can be used anywhere. It works on PC and Mac, and on smartphones and tablets. Students and teachers alike can respond to posts and enquiries wherever they are and whenever they need to. Whatever works best for the user, Teams can fit into their schedule. This convenience makes keeping up to date easy. Feature image by Brooke Cagle. Loving the stories Daryl – and the use of Teams memes! Thank you for sharing! We are just starting our journey into using Teams with students, in fact we have a workshop on just this next week. Would it be okay for me to contact Daryl Adair or Emma Jenkins regarding this story? Yes that’s fine – happy to share our experiences using Teams for both staff and students. Emma forwarded your email to me so we’ll organise a call this week.